After adding the ocean, the sky, Mars, Google Earth now has imagery from the Moon. Forty years after the Moon landing, you can explore the Earth's natural satellite in 3D. "Each of the Apollo landing missions is chronicled in detail through pictures and stories. We've even embedded video footage from Spacecraft Films that covers the most well-known moments on the surface. There are also immersive lunar surface panoramas, composed of photos taken by the astronauts themselves, presented for the first time in a 3D Street View style interface," explains Google. 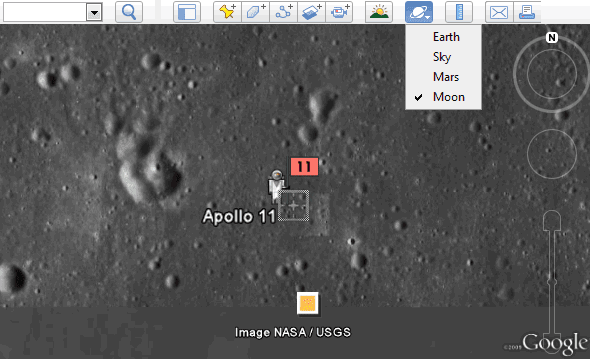 To see the Moon, you need a recent version of Google Earth: after installing the software, click on the planet button from the toolbar and select "Moon". ... "Exploring the moon" must be the dullest thing one could do on the Net. Perfect for guys who can spend hours with a magnifying glass and a bowl of chocolate pudding. i want ti travel into the space.